Our family LOVES to travel! We make sure that everyone is having a blast by doing these 13 things! And traveling during ANY holiday is even more fun! But, in all the fun chaos, sometimes we neglect to think about simple safety procedures that are absolutely necessary. When planning our travels, I found this article that’s a super helpful reminder about why safety is so important! If you’re like me, you might be surprised which days and times are known to have the most dangerous and deadly traffic accidents! I thought Christmas or Spring Break would be #1! This article gives you the statistics and answers to that! If at all possible, try to limit your traveling on these days and make sure you’re off the road after dark to avoid drunk drivers. Incredibly sad that parents have to be concerned about that! You also have to think about the safety of your car, little hands grabbing dangerous objects etc. 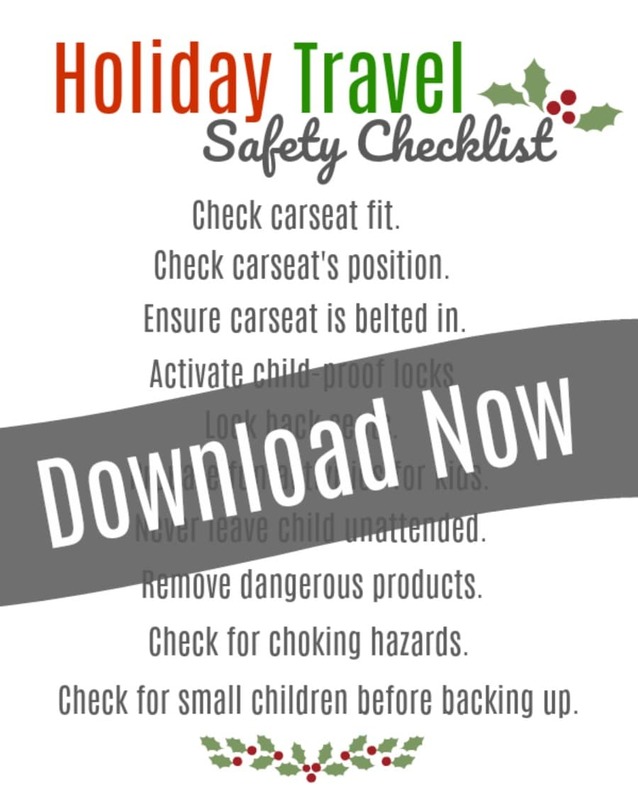 And to make keeping your kids safe a little bit easier, I’ve created a simple printable list you can keep in your car so you’re reminded of these safety strategies during all your busy days of travel! Why should you keep this list handy? In the craziness of busy holiday travel, safety precautions in cars are often neglected and forgotten. We spend loads of time and money child-proofing our homes, why not ensure our automobiles are safe as well? 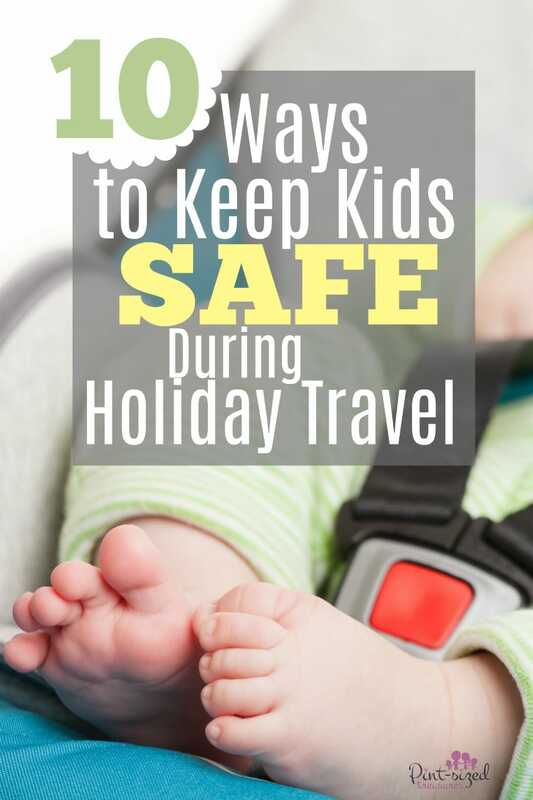 Let’s all enjoy our family holiday travels — the safe way! Choose a car seat seat that fits your child. Check the height and weight guidelines on the car seat or booster you are using in the car. Compare the measurements to your child’s actual size and make sure it is the correct fit. If it’s not, make that your number one priority before doing any holiday travel! Properly position the car seat in the back seat. Never place a car seat in the front seat or near an air bag. Also, it is best to place the car seat in the middle of the back seat so your traveling companion cannot attempt to unlock the doors or roll down the windows. Check and double check that your child is fastened snugly in the car seat. Don’t forget to make sure that the actual infant seat is attached to the seat of the car. This is a step that many hurried parents forget to check. Remember: safety is more important than the time on the clock! Bring simple snacks and drinks. This will help the driver not be distracted by kids whining being hungry or thirsty. Choose any of these super easy snacks to keep in your car for family travel! Prepare fun activities kids love. Children can quickly become bored while traveling. Prepare fun activities so little tykes will not be tempted to explore the car doors and locks. Here’s a list of 25 ways to keep your kids occupied during family travel! Never leave a child unattended. A child should never be left alone in the car. Period. It’s not a huge hassle to take your child with you. Safety of a child is always more important than convenience! Keep dangerous chemicals out of reach. Air fresheners, windshield washer fluid, motor oil and other chemicals are often left stored in the back seat of a car for easy accessibly. If a small traveler is accompanying you, remove all these items before you embark on your journey. Remove any choking hazards. Small toys, plastic shopping bags and other objects can quickly become a chocking hazard. Always keep the back seat clear of small items. Take a few extra moments and look thoroughly around your vehicle for children who are playing, running or even hiding. Accidents typically happen when people are in a hurry, so slow down to take extra precautions when traveling with or near children! I truly hope your family’s vacations are filled with unforgettable, magical memories and super-safe travels!